LaVieque Seashell Sequin Collection Trays. 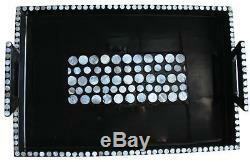 Luminous Dimension Black Large Lacquer Tray with Seashell sequin inlay. Give a playful wink to clean, contemporary design with this gorgeous statement piece. Our sleek, black Large Lacquer Tray features hand-laid shiny seashell sequins mosaic inlay around the outer edges and on the surface. Order our large wood tray with handles to add a bold accent to any home décor scheme. Bring the zest to your breakfast tray in bed or classy tea-time afternoons. Decorate your kitchen or living room with these beautiful contrasting colours. Our large food serving trays make a unique handcrafted home décor and a great table center piece. It can also be used as a large ottoman tray. 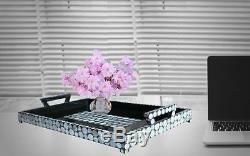 This lacquer art wood serving tray with handles home accessory makes great gift for anyone with an eye for fun and functional home décor. Our hand-painted wood serving tray with handles can be used as a serving or decorative platter, or add legs to create a unique accent table. This gorgeous designer home accents are a perfect unique housewarming gift ideas for couple or a housewarming gift for men. Whether keeping for yourself or giving as a gift, this handmade tray will always serve up style. Sizes in Inch (LWH): 19 x 12 x 3.2 Sizes in Cm (LWH): 48 x 30 x 8. Weight per Item : 2.4lbs (1.1kg). Ships Worldwide from United States. LaVieque Décors Lacquerware collection takes at least 60 days to hand make for each item! Almost 100% of the whole production process is implemented by hand. Our lacquer art products are non-toxic and food safe as we use natural lacquer from a clear sap resin derived from Anacardiaceous trees. The base/core/inside materials uses a mixture of different kinds of materials such as bamboo, compressed paper, composite, MDF, plywood, fiber wood, coconut shell and local timbers. The item "Luminous Dimension Black Large Lacquer Tray with Seashell sequin inlay" is in sale since Friday, March 10, 2017. This item is in the category "Home & Garden\Kitchen, Dining & Bar\Dinnerware & Serving Dishes\Trays".